After breakfast we will drive about 3-4 hours to the border of Lesotho. On the way, we stop for some photos of the great scenery (which, unfortunately I can’t post, because I accidentally deleted them). We have lunch in Clarens, a cute, but touristy town, before meeting, Frank and Lungelo the Sani Pass Tour guides, who will be our guides in Lesotho ( pronounced as if it were written ” l’shoo-too”). After border formalities which are about like going from the US to Canada by car, we drive about two hours to our hotel. 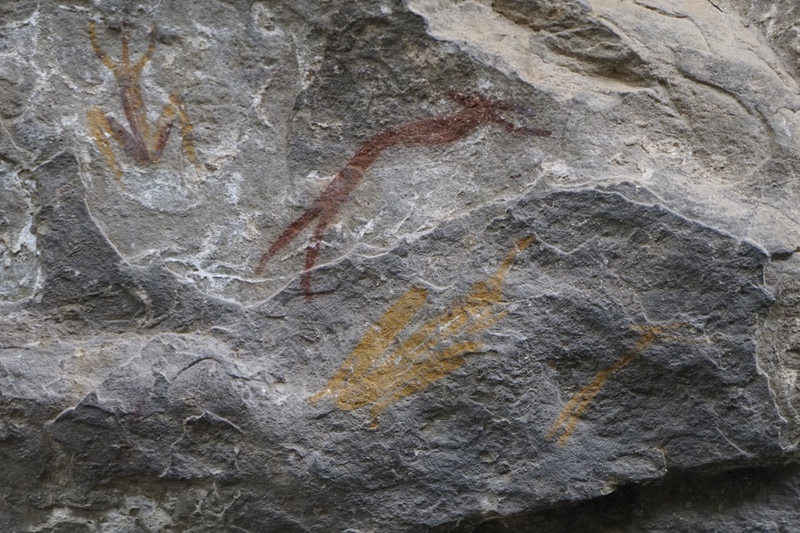 On the way, we stop at Liphofung Caves to see Bushmans rock art. 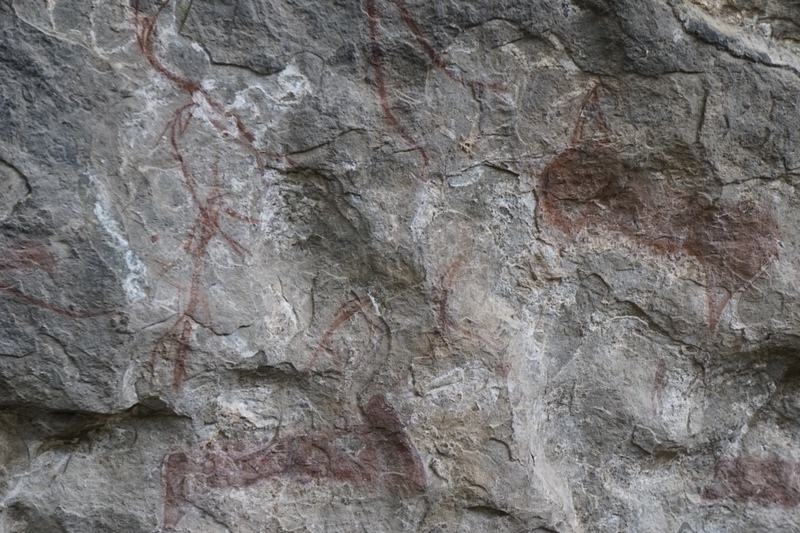 The Liphofung “place of the eland” Caves occupy an important place in Lesotho history. 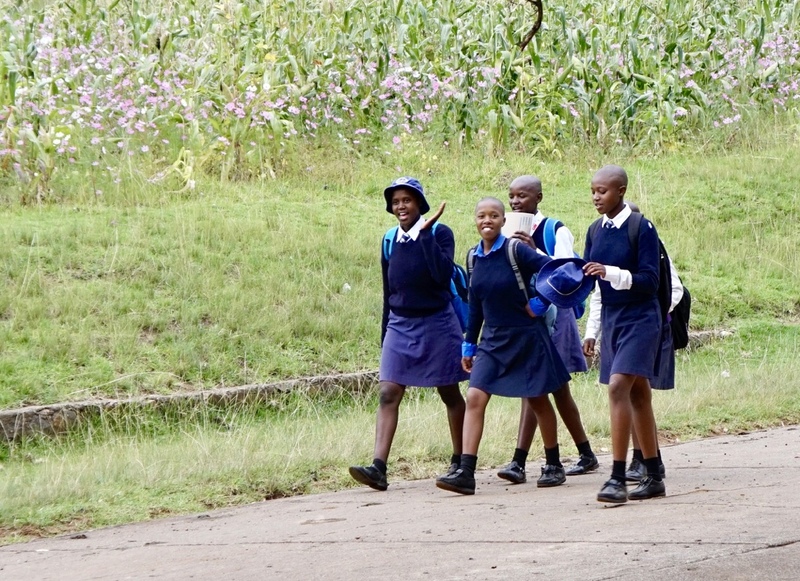 This is the smallest of the Lesotho Highlands Development Authority. 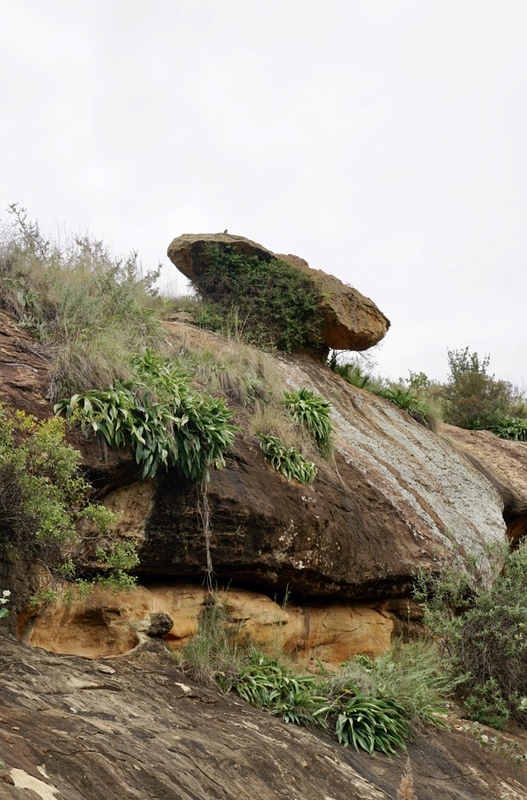 The cave is in fact a large sandstone overhang, which is a typical feature of the Lesotho lowlands region. 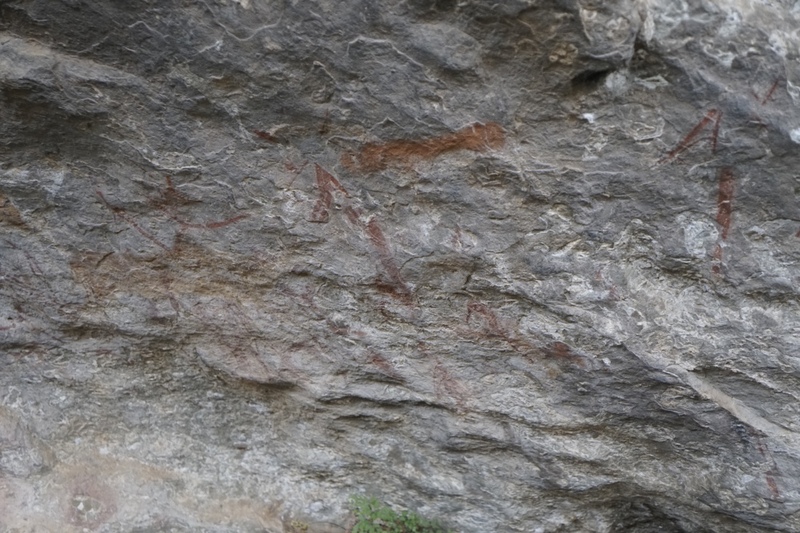 Originally used by the San and other Stone Age people, the walls contain important rock art and a rich archaeological deposit of Stone Age implements. Later, King Moshoeshoe “the Great” used the cave as a stopover when visiting that part of the kingdom. The road to the caves is largely paved and there are railings in most places, so that the walk is quite doable. The altitude (we’re at 6000 feet) does leave me a bit short of breath. We continue on through the scenic highlands. 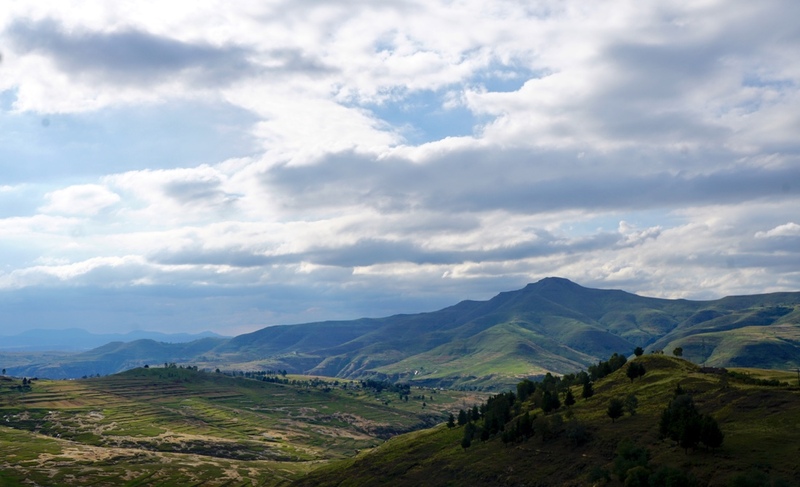 This is where the Maluti Mountains start and this magnificent range is the home of the Oxbow part of the Butha-Buthe region of Lesotho. The area experiences its coldest time during the winter months of July and August and even has a small skiing area. I’m not much on landscape photography, but here’s an attempt to give you some idea of what we see. Here are a few other scenes we see along the way. Lesotho, known as the Mountain Kingdom or Kingdom in the Sky, holds a wealth of different experiences in store for those who visit there. Mountains, valleys and rivers present unforgettable panoramas for visitors. 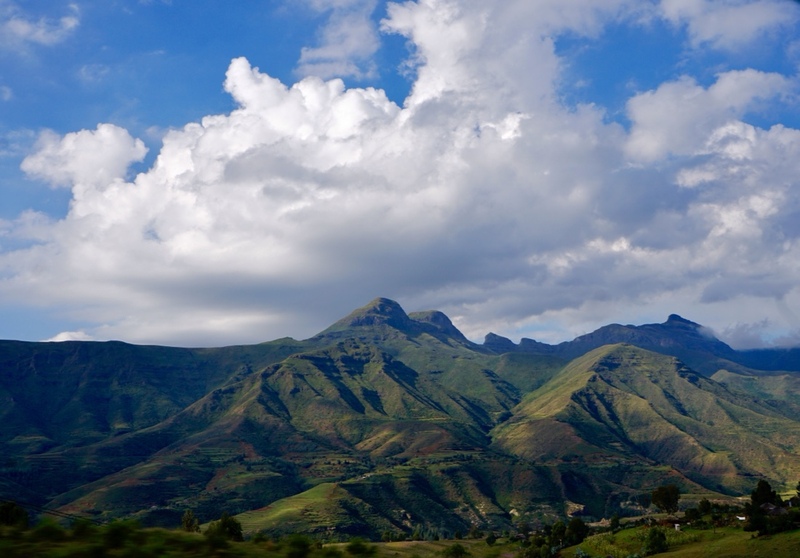 The mountains are the source of Lesotho’s crystal-clear water, which also waters the green pastures for livestock. Diamonds are among the minerals found in the mountains. 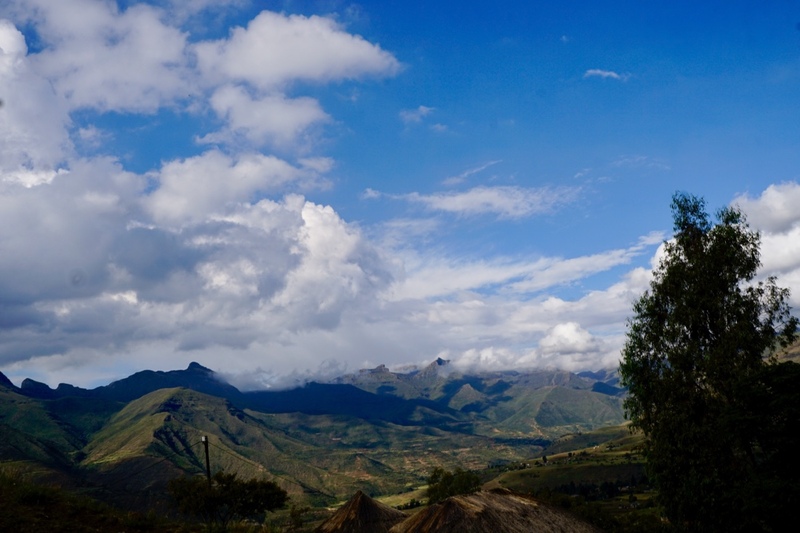 Indeed, Lesotho can truly be called the Kingdom in the Sky. 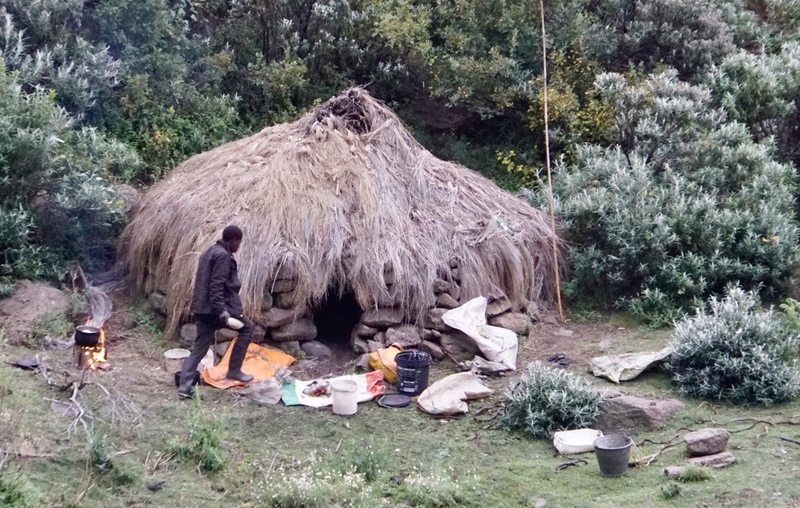 The Basotho are a Bantu ethnic group whose ancestors have lived in southern Africa since around the fifth century. 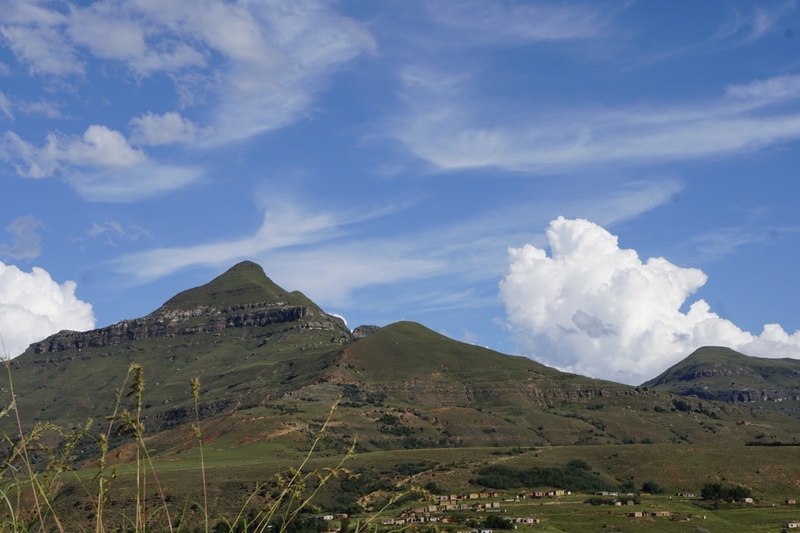 The Basotho nation emerged from the accomplished diplomacy of Moshoeshoe I (pronounced mo-SHWAY-shway), who gathered together disparate clans of Sotho–Tswana origin that had dispersed across southern Africa in the early 19th century. Most Basotho today live in South Africa, as the area of the Orange Free State was originally part of Moshoeshoe’s nation (now Lesotho). Both men and women invariably wear the wool Basotho blanket as a cloak, regardless of the season. The careful selection of color and pattern allows for individual expression. 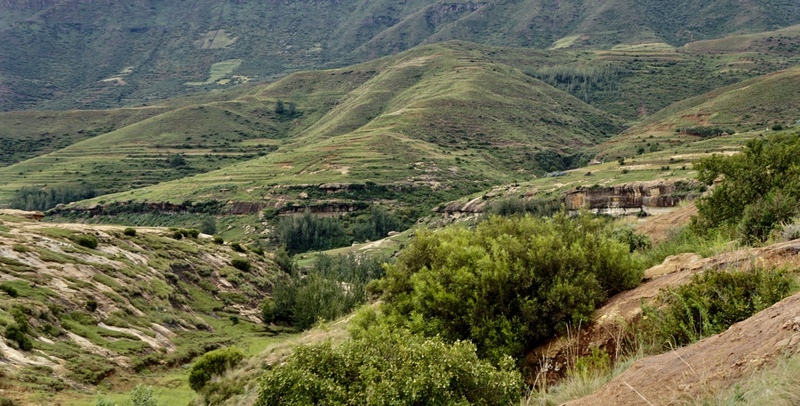 Everywhere in Lesotho, one sees the small, sturdy Sotho pony, adept at negotiating the steep mountains and gullies and indispensable for carrying the grain to the mill for grinding. The nation’s flag, adopted in 1987, has diagonal stripes of white, blue, and green. White is symbolic for peace (khotso), blue for rain ( pula ), and green for plenty ( nala ). A shield that is part of the country’s coat of arms appears in the upper left diagonal space. The national anthem is “Lesotho, Land of our Fathers” (Lesotho fatse la bontat’a rona). For those of you interested in Lethoso history, try this. 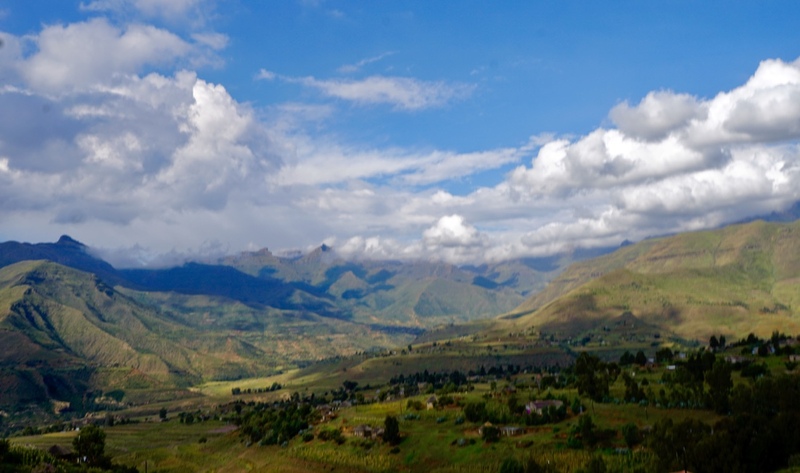 The history of people living in the area now known as Lesotho goes back as many as 40,000 years. The present Lesotho (then called Basutoland) emerged as a single polity under paramount chief Moshoeshoe I (pronounced mo-SCHWAY-SCHWAY) in 1822. Under Moshoeshoe I, Basutoland joined other tribes in their struggle against the Lifaqane associated with the reign of Shaka Zulu from 1818 to 1828. Subsequent evolution of the state was shaped by contact with the British and Dutch colonists from Cape Colony. Missionaries invited by Moshoeshoe I developed orthography and printed works in the Sotho language between 1837 and 1855. The country set up diplomatic channels and acquired guns for use against the encroaching Europeans and the Korana people. Territorial conflicts with both British and Boer settlers arose periodically, including Moshoeshoe’s notable victory over the Boers in the Free State–Basotho War, but the final war in 1867 with an appeal to Queen Victoria, who agreed to make Basutoland a British suzerainty. 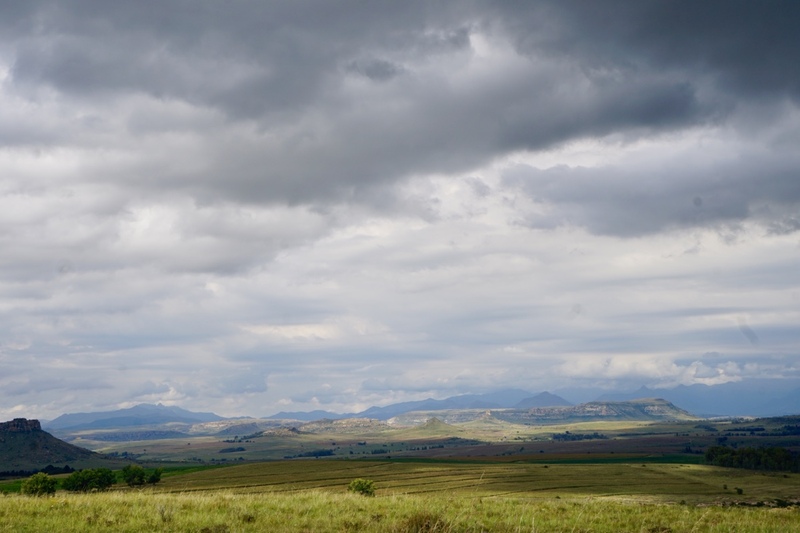 In 1869, the British signed a treaty at Aliwal with the Boers that defined the boundaries of Basutoland and later Lesotho, which by ceding the western territories effectively reduced Moshoeshoe’s kingdom to half its previous size. The extent to which the British exerted direct control over Basutoland waxed and waned until Basutoland’s independence in 1966, when it became the Kingdom of Lesotho. However, when the ruling Basotho National Party (BNP) lost the first post-independence general elections to the Basotho Congress Party (BCP), Leabua Jonathan refused to cede and declared himself Tona Kholo (Sesotho translation of prime minister). The BCP began an insurrection that culminated in a January 1986 military coup forced the BNP out of office. Power was transferred to King Moshoeshoe II, until then a ceremonial monarch, but forced into exile when he lost favour with the military the following year. His son was installed as King Letsie III. Conditions remained tumultuous, including an August 1994 self-coup by Letsie III, until 1998 when the Lesotho Congress for Democracy (LCD) came to power in elections which were deemed fair by international observers. Despite protests from opposition parties, the country has remained relatively stable since. 1820s – Basutoland founded by Moshoeshoe, who unites various groups to repel challenges from Zulus. 1834 – Territorial encroachment by Boer trekkers starts decades of conflict. 1860s – Becomes a British protectorate. 1871 – Annexed to the Cape Colony. 1884 – Becomes a British colony after revolt against Cape Colonial rule. Paramount chiefs retain large degree of autonomy. 1939-45 – World War II, with 20,000 Sotho serving in the British forces. 1950s – Political parties emerge, press for independence. 1966 – Independence as Kingdom of Lesotho, with Moshoeshoe II as king and Chief Leabua Jonathan (Basotho National Party) as prime minister. 1970 – Oppostion Basutoland Congress Party leads in polls but Chief Jonathan suspends constitution, sends king into temporary exile. 1986 – South Africa blocks borders, demanding expulsion of anti-apartheid activists. Major-General Justin Lekhanya replaces Chief Jonathan in coup. 1990 – King Moshoeshoe II goes into exile. His son is sworn in as Letsie III. 1991 – General Lekhanya forced out by Colonel Elias Tutsoane Ramaema, who lifts ban on political activity. 1993 – Basutoland Congress Party comes to power in elections. 1994 – Fighting among rival army factions. 1995-1996 – Moshoeshoe II restored to throne, but dies in a car crash. Letsie III restored as king. 1998 – Lesotho Congress of Democrats (LCD) wins general elections, Pakalitha Mosisili becomes prime minister. South African Development Community (SADC) sends troops to help restore order after opposition riots. 2002 June – Prime Minister Mosisili is sworn-in for a second five-year term. hundreds of thousands face shortages after three-year struggle against drought. 2004 March – Official opening of first phase of multi-billion-dollar Lesotho Highlands Water Project, which supplies water to South Africa. 2007 February – Ruling LCD wins early parliamentary elections, taking 61 of 80 constituencies; leader of the opposition All Basotho Convention (ABC) challenges the outcome. 2007 July – State of emergency declared as Lesotho experiences its most severe drought in 30 years. 2012 May – ABC’s Thomas Thabane becomes prime minister following elections. 2014 August – Prime Minister Thabane flees to South Africa, accusing the military of trying to overthrow him. 2015 February – Pakalitha Mosisili becomes prime minister at the head of a coalition formed after early elections. 2017 June – Prime Minister Mosisili loses early elections, Thomas Thabane returns to power. 2017 September – The head of the armed forces, Khoantle Mots’omots’o, is shot dead. A multinational security force is deployed to ease tensions.